A current research project aims to modify radiata pine lignin to make it more like that of hardwood lignin to improve processing efficiency. The research contributes to our ambitions to grow New Zealand’s bioeconomy, and one way is to make bioproduct processing easier and more efficient than the existing alternatives. Using trees for pulp, paper and biorefining is a key example. To make use of wood fibres, they need to be separated from the lignin that glues them together. The softwood trees that grow so well in our planted forests contain a type of condensed lignin that is much more difficult to separate than the syringyl (S)-rich lignin found in hardwood trees. Scion produced a small crop of young radiata trees modified to contain S-lignin, based on an initial proof of concept that showed softwood cells could produce the novel lignin. These trees formed a field trial that allowed the S-lignin radiata to grow in a forestry setting where Scion’s team could collect data and carefully monitor the trees’ growth and performance. 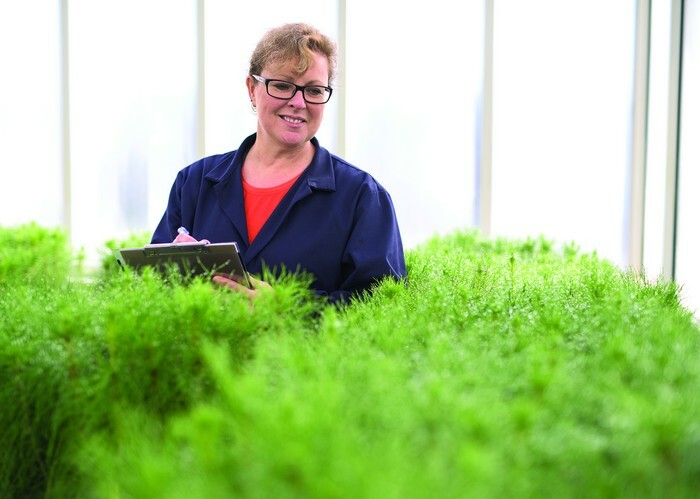 Molecular biologist Lorelle Phillips monitors a crop of seedlings in Scion’s containment facility.